Salt Lake Community College campuses could be completely tobacco free as early as Fall semester, 2013. Feedback will be taken until the end of the current semester, if you have feedback about this policy stop by the Health & Wellness office at Taylorsville Redwood Student Center Building or email peter.moosman@slcc.edu. Over 800 U.S. colleges and universities have implemented full campus bans on smoke or tobacco, and SLCC Health & Wellness Services is moving to add SLCC to that list. 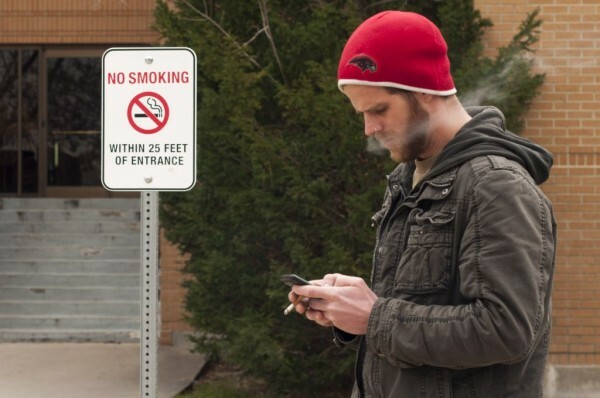 They have proposed a tobacco free campus policy that would require smokers to go to the nearest public sidewalk to smoke. As one reason for the policy change, Moosman cites the difficulty in enforcing the college’s current tobacco policy, which bans smoking within 25-feet of a doorway or an open window in accordance with the Utah Indoor Clean Air Act. If implemented, their proposal would completely ban any form of tobacco product. A 2011 survey showed that 86 percent of SLCC students believed that secondhand smoke is either extremely or very harmful. “I want to see a healthier campus and if that means that I can’t smoke on campus I’m ok with that. That means that I will either need to find other places to smoke off campus or maybe that is the impetus I need to quit,” says instructor Matt Merkel. Chalmers says that Health and Wellness Department is taking the easy way out of a complex issue. He says that the school should consider other options other than just taking away smokers’ rights. Asthma, even if it is controlled with medicine, falls within the protection of the ADA. After collecting data and comments regarding the proposed policy, Health & Wellness officials felt that the best option for SLCC is a tobacco free campus policy. “Give an option to people. Give us an area, like at airports there’s a smoking area. That’s perfectly reasonable,” says Chalmers. Moosman said that Health & Wellness Services looked into implementing designated smoking areas, and found that the only places that fit the law tended to be high traffic areas or locations that were close to public walkways. “Our college campuses are so small that there really weren’t any locations to put the smoking stations,” says Moosman. The estimated cost for each smoking station or gazebo was upwards of three thousand dollars. “Another thing about the smoking stations is that it didn’t insure that non-smokers wouldn’t be exposed to secondhand smoke,” says Mooseman. The proposal has been presented to the student government and to the Dean of Students. The proposed tobacco policy is currently in the feedback process, and the next step is to evaluate the feedback and present the proposal to the vice president of the school. If the policy is approved, enforcement would begin during the Fall 2013 semester.